We've had better summers than the current one. It's been raining a lot, the temperatures are a few degrees below the usual over-20C, and the sunshine has been limited. Quite sad, actually, but apparently that's the case with most central and northern European countries this year. However, on Saturday morning the rain had stopped, the skies had cleared and the sun was out, so we packed our little family into the car, picked up one of the grandmothers and drove out of town to forage for wild strawberries. Couple of hours and a healthy dose of fresh country air later we returned home with just about a kilogram (over 2 pounds) of the precious berries. (Note that I'm talking about the real wild berries, Fragaria vesca, not the oblong cultivated Alpine strawberries, Fragaria vesca var. semperflorens). Usually I make wild strawberry fridge jam, but I had done that on Friday night with 2,5 kilos of wild strawberries we had bought at a market. The next usual step would be to mix the berries with a sprinkling of sugar and some grass-fed milk, but I had done that already, too. We also had friends coming over for dinner on Saturday night, so I wanted to do something special and different this time. 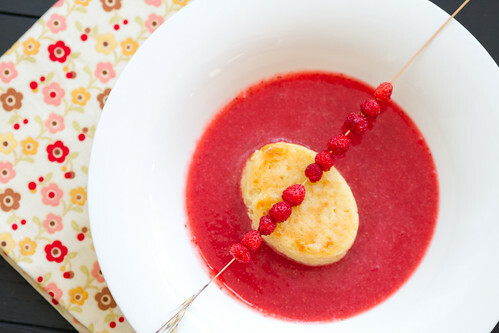 Remembering that the Swedes love their smultron a lot as well, I turned to their popular Allt om Mat recipe site, and came across this wonderful recipe for an ice-cold/semi-frozen wild strawberry soup with warm marzipan cheesecake. 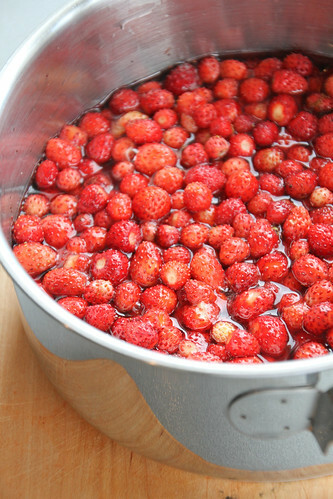 First prepare the ice-cold wild strawberry soup/couilis. Using an immersion blender/hand-held blender, process the berries and the syrup until smooth (if you dislike tiny seeds, you can press the whole thing through a fine sieve, but I found it totally unnecessary). Season to taste with vanilla and lemon juice, then place into the freezer for a few hours. Give the mixture a stir every now and then. About 45 minutes before you intend to serve the dessert, make the marzipan cheesecake. Preheat the oven to 175 C/350 F.
Grate the marzipan coarsely or simply use your fingers to divide it into small crumbs. Mix with the rest of the ingredients and process until smooth (again, I was using my immersion blender). Divide the mixture between six buttered small ramekins or silicone muffin/friand tins. Bake in the middle of the pre-heated oven for about 25 minutes, until the cheesecakes look cooked and are light golden brown. Remove the marzipan cheesecakes from the oven and let cool for 10-15 minutes. Remove the cheesecakes carefully from the tins and place on six dessert plates. Pour the ice-cold wild strawberry coulis around the warm cheesecakes. 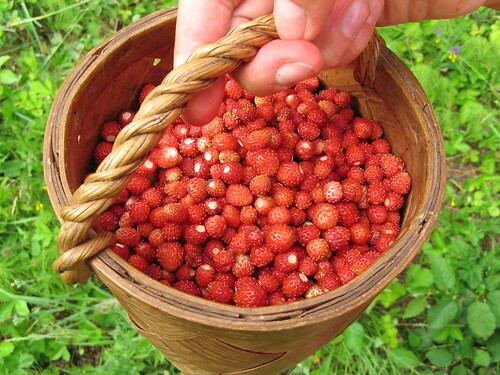 Wild strawberries are so yummy and a lovely childhood memory for me! It's been a long time since I last ate them! a very delicious sounding recipe! Gorgeous as always, Pille! I'm thinking peaches ... I did something similar with rhubarb earlier. i love the idea of threading the strawberries up like that! Considering need to come to Estonia to be fed by yououououou!